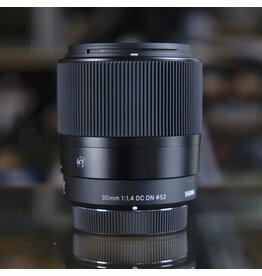 Sigma Contemporary 30mm f1.4 DC DN lens for Micro Four Thirds. A fast, sharp slightly-longer-than-normal prime lens with quick focusing. In excellent condition, with clean glass. Includes lenshood and box. Sigma Contemporary 30mm f1.4 DC DN. Sigma EX 85mm f1.4 lens for Nikon F mount. A fast, sharp portrait lens in excellent condition overall, with minor cosmetic wear, clean glass, excellent function. Sigma DC 8-16mm f4.5-5.6 HSM lens for crop-sensor Canon EOS digital SLR cameras. 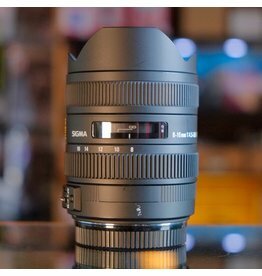 This is a good quality ultrawide lens in excellent condition, with minor cosmetic barrel wear, clean optics, good function. Really wide! 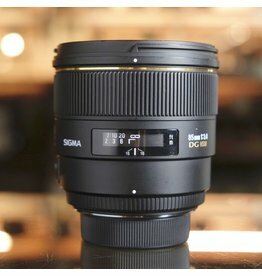 Sigma DC 8-16mm f4.5-5.6 HSM.